Situated in a protected forest just 900 metres from the glorious beaches of Longeville sur Mer, this lovely architect-designed modern 4 bedroom house features vaulted ceilings. Situated in a protected forest just 900 metres from the glorious beaches of Longeville sur Mer, this lovely architect-designed modern 4 bedroom house features vaulted ceilings. 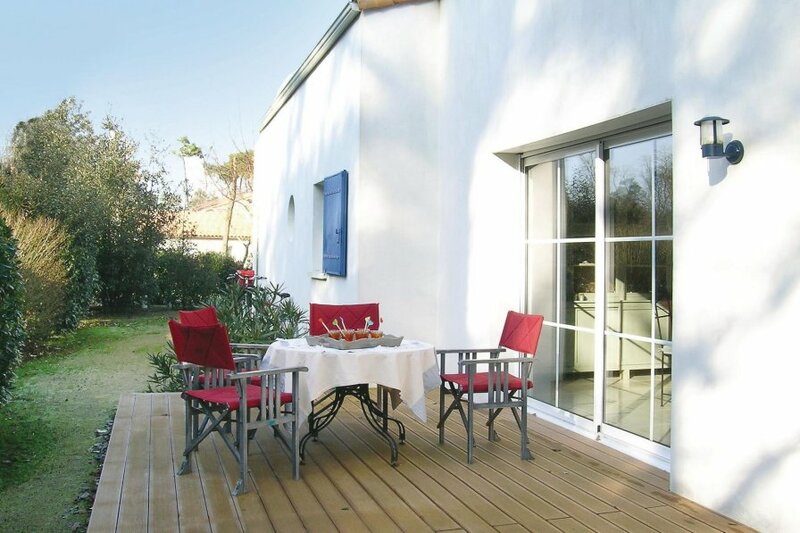 Add to this the sliding patio doors which disappear into the walls giving onto the vast wooden terrasse and the house has a real outdoor feel to it. 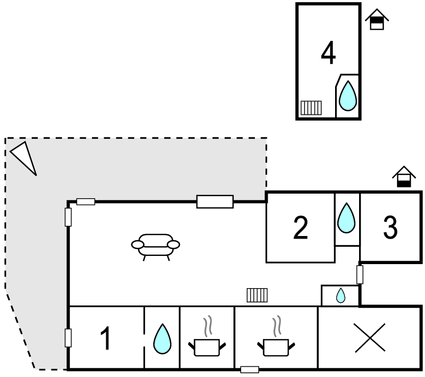 The 50m² lounge/dining area is separated by 3 steps, the lower level having a built in fire and access to the main double bedroom with en-suite shower and twin sinks. From the upper, dining level, you can access the fully fitted kitchen and from there the utility room which includes an additional fridge. The other two ground floor bedrooms share a 'Jack and Jill' style shower room. The staircase leads directly into the largest bedroom and a further toilet room. There is underfloor heating throughout, ideal for when you stay out of season. The garden is fully enclosed with a large terrasse designed to catch the sun throughout the day. The beach is an easy stroll, for relaxing and swimming, or, for the more active, there is the sailing school just 600 metres away where you can enrol for lessons. The area is also renowned for its great network of cycle paths (bike hire 500 metres away) and you can visit other local beaches such as Les Conches (6kms) and resorts such as La Tranche (11kms) but you should also try to visit Les Sables d'Olonne (28kms), the Vendée's best known resort with its long promenade of shops and cafés, popular year round. Locally you also have 2 golf courses, tennis, casinos, and shopping centres, offering all kinds of entertainment for all the family. This solidly constructed modern villa was recently built in 2005. The agent has rated it as a four star property so it is a well-equipped villa with above average furnishings. It is also great value for money. The villaIt is located in Longeville-sur-Mer, 30km from Les Sables D´Olonne. It is set in a very convenient location, just 900 metres away from a sandy beach. There's also a restaurant 3km away. The villa has free wireless internet. You can also park on-site at no extra charge. The villa is well equipped: it has a refrigerator, microwave, dishwasher and extra refrigerator. It also has a barbecue and some garden furniture outside.